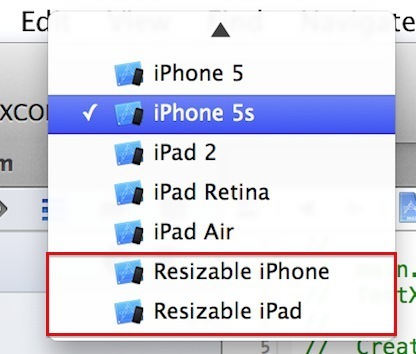 With the release of Xcode 6 today after Worldwide Developer Conference, developers have found an option within Xcode to size apps for devices referred to as "Resizable iPhone" and "Resizable iPad", as pointed out by Mac4Ever [Google Translate]. The option is next to other Apple devices, including iPad Air, iPhone 5s, and iPad Retina. The options are likely to enable developers to start developing apps that fit on the rumored larger 4.7 and 5.5 inch screens of the iPhone 6 and, perhaps, the rumored 12-inch iPad Pro. Another photo of the Xcode simulator shows the difference between an app visually optimized for an older iPhone in what appears to be the resolution for one of the two iPhone 6 models. It's not yet known what the exact resolutions are for the 4.7 and 5.5 inch iPhone 6 models or even the rumored 12-inch iPad Pro, but the "resizable" functionality would allow developers to explore building versions of their apps for larger screens that are currently available. Still not seeing the Xcode update in the App Store. It's in beta right now! Would also be good for testing how your app looks in half-screen landscape. Just in case that feature gets enabled in iOS 8 or a future release. Clearly, the most exciting announcement is this resizable iPhone and iPad hardware! How DO they do it?! While this isn't absolute confirmation, it looks good for bigger screen sizes. Now I am only missing widgets in my quest to return to the iOS ecosystem. Maybe iOS9? Don't like it. Don't buy it. Its really simple. It's $99/year. I don't know how else you an get around it. I wish Apple would let every developer try out the platform who wants to. I'm not quite sure of the logic. $99/yr is cheap. Real cheap, just over $0.25 a day. You spend more than that on soda. It just provides enough "friction" to dissuade those who aren't serious about development to any degree, people who really aren't suitable for using a beta version of infrastructure components (when, not if, it breaks it can really screw things up). If you don't have enough "skin in the game" to cough up $99/yr, wait for the proper release.